“The problem is there is a conflict between the federal law and the state law, and I’m not making a policy comment on what the right outcome is, but I, too, share your concern,” he said. Calls for clarity on the banking issue have been widespread. Last week, the presidents of three Federal Reserve banks urged lawmakers to pass legislation that would provide guidance to financial regulators on servicing cannabis businesses. These companies have made clear to Congress that the existing situation, which has forced the industry to operate on a largely cash-only basis, is untenable. 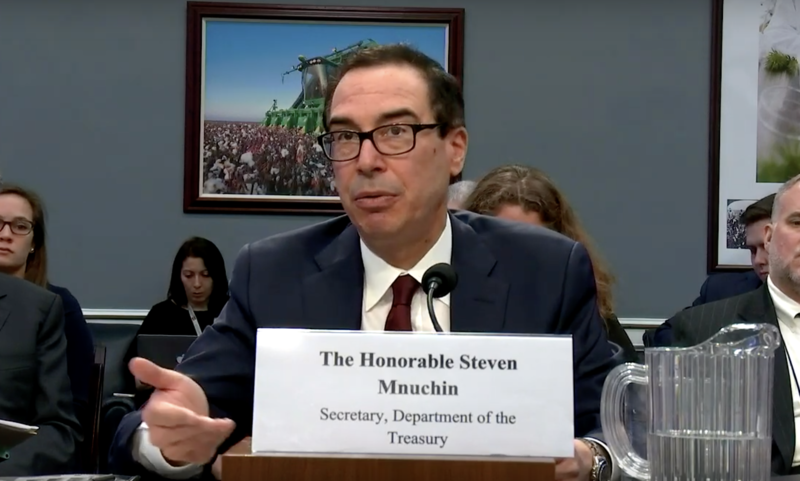 Rep. David Joyce (R-OH) also raised the issue during the hearing, asking Mnuchin if he could connect him with senior staff members at the Treasury to advise in the legislative process. The secretary said he would follow up and then repeated that conflicting federal and state laws are at the center of the problem. “We’re not taking a policy position on the conflict of federal versus state, but this is something that does create a conflict in our ability to administer many areas,” he said. “When I look at crime around facilities that sell cannabis, it’s a big issue in our communities and I hope that you’ll take some time to look into that,” she told the secretary. At least one potential legislative fix has taken shape in recent months, with a bipartisan bill that would protect financial institutions that work with marijuana companies having passed a key committee with a bipartisan vote last month. That legislation is expected to be placed on the calendar for a full House vote in the coming weeks.